Alzheimer's Disease. An Historical and Scientific Overview. Biochemistry and Ultrastructure of Paired Helical Filaments. Tau and Its Significance for Alzheimer's Disease. Mutations in the APP Gene in Alzheimer's Disease. Transcriptional Control of APP Expression. Post-Translational (Non-Proteolytic) Modification of APP. Proteolytic Processing of APP. Neurotoxicity of B-Amyloid and APP. Biological Functions of APP. Animal Models of Alzheimer's Disease. Relation of Plaques and Tangles to Alzheimer's Disease Phenotype. Apolipoprotein E and Alzheimer's Disease. Subject Index. Neuroscience Perspectives provides multidisciplinary reviews of topics in one of the most diverse and rapidly advancing fields in the life sciences. Whether you are a new recruit to neuroscience, or an established expert, look to this series for 'one-stop' sources of the historical, physiological, pharmacological, biochemical, molecular biological and therapeutic aspects of chosen research areas. The last decade has seen tremendous advances in our understanding of the pathobiology of Alzheimer's disease. These will lead to the first generation of drugs aimed at prevention rather than cure. This book covers some of the most important and exciting of these advances, with chapters written by many of the leading researchers in the field. With genetic studies as a backbone to this volume many chapters are devoted to the function and regulation of amyloid b-protein precursor (APP) and apolipoprotein E (ApoE). 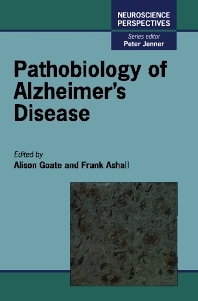 Other chapters describe cell biological approaches helping to piece together the link between the genetic alterations and the phenotype we call Alzheimer's disease. Although APP and its proteolytic cleavage product, amyloid b-protein, do not answer all the questions, detailed research into this system has undoubtedly increased our knowledge of the pathobiology of AD and has lead to the identification of other risk factors. Understanding the role of ApoE in the pathology of Alzheimer's disease promises to open a whole new field in AD research. A comprehensive description of the role of amyloid B-protein precursor in Alzheimer's disease. St. Louis University School of Medicine, Missouri, U.S.A.